Fresh off a win over top-ranked Nemaha Central, the No. 2 Silver Lake Eagles will face another battle of the unbeatens against the third-ranked Galena Bulldogs. Last week, Silver Lake knocked off Nemaha Central with a 25-7 victory. Mason Griffin threw a pair of touchdown passes to Trent Byers in the first half – the first coming on a shovel pass. On the season, Griffin has passed for 1,754 and 19 touchdowns with only two interceptions. Mason Jones has rushed for 908 yards and 18 touchdowns on only 140 carries. Byers has 46 receptions for 719 yards and eight TDs. Keenan Baird has 28 receptions for 443 yards and five touchdowns. Silver Lake is back I the quarterfinals after falling to Nemaha Central last year in the second round. The Eagles haven’t reached the quarterfinals since 2014 after second-round losses in each of the past two seasons. 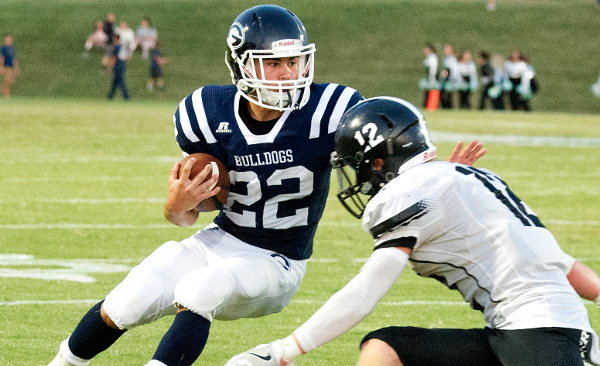 Galena rolled through a competitive Crawford-Neosho-Cherokee League, earning wins over multiple 4A Division II schools, as well as 2-1A powerhouse St. Mary’s Colgan. Last week, the Bulldogs earned a 28-6 win over Wellsville. JC Shelton rushed for a pair of touchdowns and passed for another in the win. Galena is in the quarterfinals after falling in the second round in each of the previous three seasons. It should be a competitive game, and the winner will have a good chance of making it to the state championship game. This is a rematch of a surprising Hesston win, 38-26, on the road in the Class 3A quarterfinals last year. In the semifinals, Hesston then defeated Hoisington, 35-19, in another upset en route to the Class 3A state title game. The Swathers fell to Rossville, 48-42, in overtime. This year, Hesston again pulled an upset with a 45-42 road win versus previously undefeated Conway Springs last week. The Swathers moved to fifth in the 3A rankings, while Phillipsburg bumped from second to first after top-ranked Nemaha Central lost. Phillipsburg junior quarterback Trey Sides, a three-year starter, is expected to miss the rest of the year with a thumb injury. His brother, freshman Ty, is expected to step in under center. Trey Sides was also a starting defensive back. Ty has played well this year on special teams, including a key punt return against Hoisington last Saturday. Phillipsburg rolled over Riley County, 48-13, in the first round of the playoffs and then pulled away to beat Hoisington, 35-6. Hesston had a 24-yard field goal from Jorge Morales as time expired to beat Conway Springs, 45-42. The game was tied four times and had four lead changes and had just one punt. Cameron Cox completed a 59-yard TD pass on the final play of the first half for a 28-22 lead. He passed for 271 yards and three scores, and rushed for 154 yards and three TDs in a marquee performance. Hesston finished with 518 yards of total offense for first-year coach Tyson Bauerle. Speedy running back Parker Roth finished with 95 rushing yards, and Reece Nebel had eight catches for 103 yards and a TD. Phillipsburg has outscored teams 565-91 and leads 3A in scoring defense and stands second in offense. Hesston is at 425-315. Last year, Phillipsburg was at 464-123 entering the Hesston matchup. The Swather loss is Phillipsburg’s only defeat in the last 30 games. Even with Sides out, Phillipsburg still has a bevy of weapons and a massive offensive line with running back Kirk Coomes, Treylan Gross and John Gower. Cousins Chris (team-high 10 TFLs) and Noah VanKooten have anchored the line, while Gower leads with 86 tackles. Coomes leads with 104 carries for 969 yards and 18 scores. In Week 7, the Panthers did allow more than 300 yards passing to TMP quarterback David McFarland, the state leader in passing yards during the regular season. However, Phillipsburg has been dominant against the run and gotten off to fast starts. Last season, Hesston had a kick return for a score and returned a fumble for a touchdown in the Phillipsburg win. The Swathers likely need another big defensive/special teams play and another key performance from Cox. Phillipsburg has improved from its 11-1 team in ’16, especially with great experience and depth up front.